Test your adventurous spirit on the Karlkloof Canopy Tour and swing from the trees! Have a tasty lunch and admire the waterfall at Caversham Mill. Admire Renaissance Antiques just across the road from Michaelhouse school for a beautiful mix of restored antiques, new furniture and unusual décor items. Eat Italian at LaLampara - gorgeous for an outdoor lunch on a sunny afternoon..
A picnic lunch at Yellowwood Café looking out over the Howick falls. A great place for kids with the expansive lawns, farm animals and jungle gym. You cannot beat coffee at Terbedore Coffee and add a cheese platter for two as you snack under the trees. Laze about in a hammock from Heavenly Hammocks, a short drive from the golf course and Terbedore. Dragon Fire Beads displays handmade Murano glass jewelry and beads - watch jewelry being made before your eyes, book a lesson! Close to Woodridge the Midmar dam hosts the Midmar mile each year. The Midmar Mile is a swimming race held annually in February at the Midmar Dam north of Pietermaritzburg, South Africa. Each year, it draws thousands of competitors, from serious international athletes and Olympic medallists to purely recreational swimmers. See Midmar Mile. In 2009 the event, in which 13 755 competitors finished the race, was recognised by the Guinness Book of World Records as the world's largest open water swimming event. The event gains its name from the location (Midmar Dam) and the distance (roughly one mile). A unique feature of the race is that while the distance covered is always a mile, depending on rainfall and the water levels in the dam, the distance swum varies from year to year. In years with poor rainfall, competitors are subject to the infamous Midmar sprint start: a bedlam of bodies sprinting across the muddy lake-shore and through the shallows until the water is deep enough to swim. The Dusi Canoe Marathon was started in 1951 and covers approximately 120 km from the cities of Pietermaritzburg to Durban in KwaZulu-Natal. 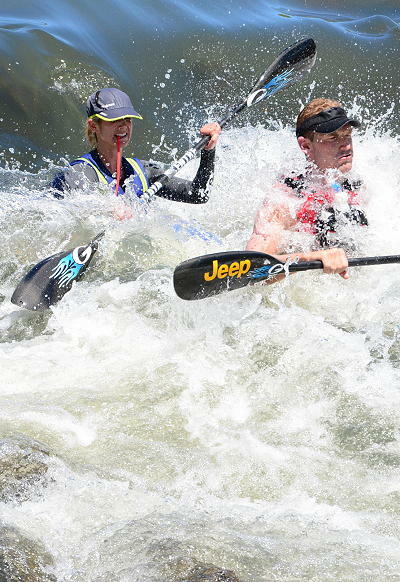 It is the biggest canoeing event on the African continent and one of the world's most popular river marathons attracting up to 2000 paddlers each year. The race takes place over three days. More information is available at Dusi Canoe Marathon. Located 10 km outside of Howick in the spectacular valley of the Karkloof Forest Reserve, Karkloof Canopy Tours is a must for all travellers with a taste for adventure. The canopy tour includes long swooping slides over the forest canopy, stops below a 15-metre-high waterfall and takes in wider views across the beautiful Karkloof valley. Flying along ziplines at speeds of up to 70km/h and reaching heights of 35 metres, the canopies is a thrilling way to take in the surrounding scenery, make new friends and give the ol’ vocal chords a good stretch. Screaming is optional but it comes highly recommended! Given the wide open spaces and mountainous terrain it is no surprise that the Midlands is home to many passionate mountain bikers and organisations such as the Howick Mountain Bike Club, who through a system of sanctioned access with land owners such as Sappi, have created the largest network of single-track available in the country.